I'm on my 37th tray of aligners now, another 3 more pairs before my treatment ends! I'll update you guys more on the next step once I get confirmation.. In the meantime, Dr Matthew revealed that my right front tooth isn't moving according to plan. It is what you would call "OFF-TRACK". It's easier to illustrate on photo - you can tell it's pretty obvious that my right front tooth isn't fitted properly into the top aligner, there is still a gap between the plastic and my tooth. 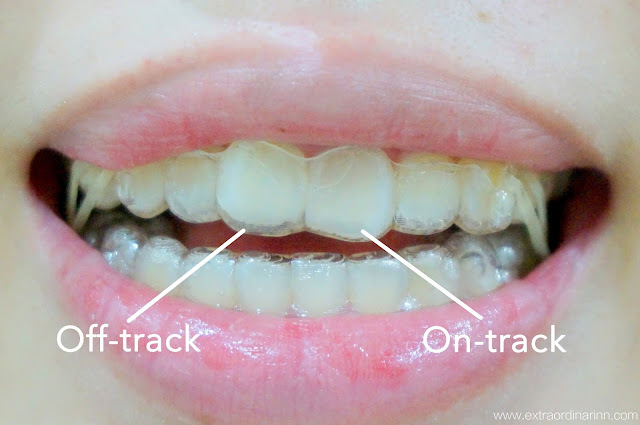 As for the left front tooth, it's ON-TRACK or tracking well because it's fitted snugly and tightly according to the aligner's shape. That's supposed to be the right way so we are trying a few ways to move the right tooth back on track. One of the causes could be because of the lack of chewing on the chewy, hence the aligner did not fit tight enough. Trust me, I've been really good nowadays and even BITE on the chewy to sleep, just so the aligner will stay in place XD Another reason is because my back molars did not move backwards (this process is called Distalisation) as much as we want it to, so the elastic bands are especially important for teeth movement. Well, Dr Matthew has a plan in store for my teeth to get it straight which I will be revealing soon.. Stay tuned! What did he do to correct it?